SANTIAGO, Jun 17 2015 (IPS) - Millions of families on South America’s Pacific coast have long depended on artisanal fishing for a living. But they have been increasingly being pushed aside by the industrial fisheries that have made this region a major player in the global seafood industry. In Latin America and the Caribbean there are over two million small-scale fisherpersons who generate some three billion dollars a year in revenues, according to the Latin American Organisation for Fisheries Development (OLDEPESCA). Three of the world’s large marine ecosystems are found along South America’s coasts. The main one is the Humboldt Current. It flows north along the west coast of South America, from the southern tip of Chile, past Ecuador, to northern Peru, creating one of the world’s most productive marine ecosystems with approximately 20 percent of the world’s fish catch, according to the United Nations Food and Agriculture Organisation (FAO). Other important ecosystems in the region – but in the Atlantic Ocean – are the Patagonian Shelf along the coasts of Argentina and Uruguay, and the South Brazil Shelf. Despite the enormous diversity of species and ecosystems, production and trade flows in the region are dominated by a handful of countries: Peru, Chile, Mexico, Argentina and Brazil, which together and in that order account for 90 percent of the region’s catch, with a total combined production of 18 million tons a year. Fishing and aquaculture have made a major contribution to the wellbeing and prosperity of the people living in South America’s coastal areas, who for centuries depended on them for a living and for highly nutritional food. “In the pre-Hispanic world fishing was an essential tool for the existence of humankind and it also provided a link with nature,” Skewes said. But the voracious large-scale fishing industry poses a threat to this way of life. This is exemplified by 57-year-old Gino Bavestrello, a small-scale Chilean fisherman from the coastal town of Corral, near Valdivia, some 800 km south of Santiago. He has worked out at sea since as far back as he can remember, and he is both the son and the father of fishermen. “I’ve been an artisanal fisherman all my life,” he told IPS with emotion in his voice. “My father was also a scuba diver; 30 years ago he found the mast of the (Chilean corvette) Esmeralda,” which sank during the War of the Pacific (1879-1883). But for the last two months Bavestrello, the head of the National Council for the Defence of Artisanal Fishing (CONDEPP), has not gone out to sea. His energy is focused on a greater good: the repeal of the controversial fisheries law. The law, in force since 2013, was promoted by the government of right-wing former president Sebastián Piñera (2010-2014) and grants fishing concessions for 20 years, renewable for another 20. Small-scale fishermen complain that the law further concentrates the activity in the hands of large-scale commercial fishing interests, because large companies can receive fishing rights in perpetuity, which can be passed from one generation to the next. The legislation also directly threatens marine life, and thus the livelihoods of small-scale fisherpersons. In addition, there have been irregularities, as a recent judicial investigation showed. 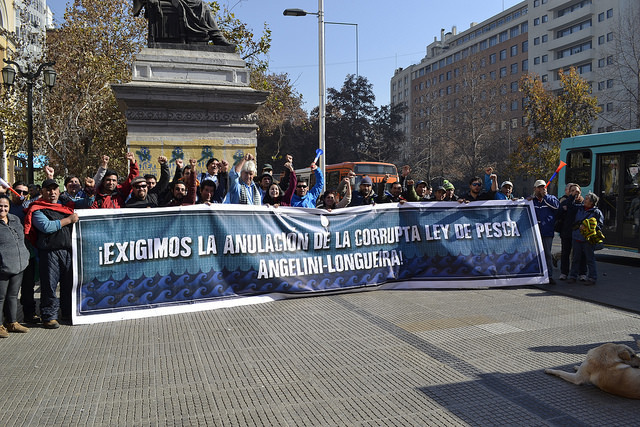 It found that the fishing corporation Corpesca, which controls 51.5 percent of the Chilean market, had paid bribes to members of the Senate fishing commission before it approved the fisheries act. “What is happening is an extremely serious problem for us,” Bavestrello said. “For two months we haven’t brought in any income. We have organised soup kitchens and thanks to people who have constantly helped us, we have been able to feed our families. “What we’re doing now is selling firewood, and we’ve fallen to the level of illegal practices, such as cutting down native trees,” he admitted. “This law needs to be modified soon. We fishermen can’t continue to face these conditions. The aim of the law is to kill us,” he asserted. CONDEPP spokesman Juan Carlos Quezada told IPS that the fishing law not only privatised marine resources, but also undermined the rights of small-scale fishermen. “Ninety percent of artisanal fisherpersons have been left without fish catch quotas,” because concessions and quotas were only assigned to industrial fisheries and shipowners, he said. “Artisanal fisherworkers who used to have quotas and used to fish were left without rights and a lot of them as a result had no work,” he complained. The unfair competition between artisanal and industrial fishers is part of a complex crisis where ecological sustainability is also at risk in South America. One example of this is Peru, where the Argentine oil company Pluspetrol has polluted rivers and lake Shanshacocha in the Amazon rainforest. Consequently, the fish catch has been reduced by nearly 50 percent in the lake. 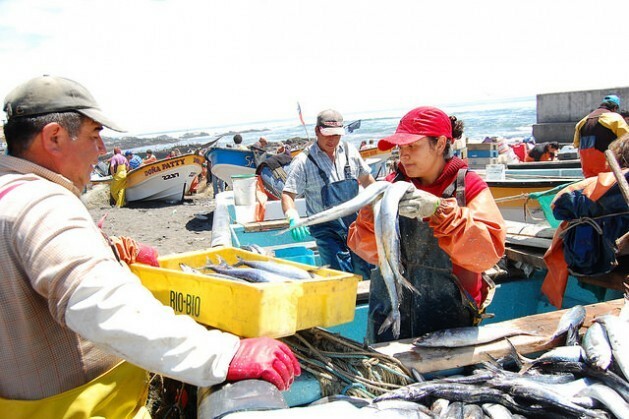 The scarcity of the Peruvian anchoveta is now endangering exports of fish meal and oil, two of Peru’s main exports. In Colombia, meanwhile, a study by the National University’s Biology Group found up to three times less fish today in the country’s waters than in the 1970s. “Industrial scale fishing in the region has increasingly put pressure on artisanal fishers,” said Skewes. “Currently we’re seeing a scenario where big industrial producers have taken over a major part of not only the ocean but the fish stocks,” he said. The damage has been suffered by low-income people who have begun to work in other areas of production – which has made the problem invisible from a social point of view, he added. But many small-scale fishers continue to fight for their rights and their livelihoods. “Today we are fighting against the poverty facing artisanal fishers, who made a living from natural resources and brought these resources to the rest of the population, boosting food sovereignty,” said Bavestrello. “We fish for a living while industrial-scale fishing interests fish to make profits,” he said.